Much the same as the weather on Saturday gave us a mixed bag, so too were the results for Vikings Rugby’s first hit out of 2019. With our ViQueens on a bye week, the 1st Division and Premier Division sides battled against the Gungahlin Eagles at Viking Park, the home side taking 3 from 5 victories for the day. We also celebrated our Ladies Day, which despite the weather was a huge success – thanks to everyone that joined us! 4th Grade kicked off their match in wet conditions, with Viking Park having copped a full evening and morning of heavy rain. None the less, nothing rained on 4th Grade’s parade, as they showed a lot of promise in their first test of the season. The real victory came pre-match – much to this writer’s surprise, every single 4th Grade player that took the field on Saturday was registered (the feat hasn’t been achieved since 2001). With attacking weapons such as Andrew ‘Chewy’ Dickson, Cameron Shaw and the industrious Siaosi Fakalolo, points came easily for 4th Grade, but the real pleasing aspect of their game was their defence. Despite having a relatively young side, 4’s didn’t allow the Eagles any points on the day – a credit to their preseason preparation. Geoff Adam made a welcome return to the field for his 306th game, while youngster TJ Ikitau and Tom Carney had superb games in the forwards. 4’s go 1-0 to start the season, winning 24-0. Possibly one of 3rd Grade’s best opening weekend teams on paper, 3rd Grade followed on from where 4th Grade finished, playing some scintillating Rugby in attack followed with some bruising defence. Sione Taula showed why he has played 100+ 1st Grade games for the Club, terrorizing the Eagles on both sides of the ball. Unfortunately the referee wasn’t as terrified, handing Sione his first yellow card of the season during the match. The backrow combination of Justice Henderson, Dan Uilelea and Andrew Talaina will be a handful for teams all season, both Justice and Dan hard over ruck ball and Talaina running just as well as he did when he first joined the Club. The backline was well steered by Blake Henderson and 3rd Grade Assistant Coach Freddie Pitasi, who debuted with 12 points through ball in hand and off the boot. Thirsty Thirds get it done, winning 22-0. As is typical of this Grade of Rugby, it was a new year and a new team for the Colts, who featured 15 debutants to the Club. The Colts started with the shape and pattern that Coach Kydd had working into their play from the get go – with a lot of new combinations, the Colts still had a slowish start but it was a very promising performance. They scored some excellent tries off simple structure and nailed their set piece. Joel Thomas, who picked up a brace of tries and Man of the Match, and John Madjaga led the charge in the forwards, as the entire pack helped the Vikings grind through the game. The 10-12-13 combination of Billy Carberry, Hunter Davis and Turi Hides was impressive, all three boys due for higher Grade Rugby throughout 2019. Facing a Gungahlin outfit that had a lot of pace, the Colties dug deep to take out a well earned victory to kick off 2019, winning 26-14. A tight see-sawing game for the Dirty 2’s, who faced a formidable Gungahlin pack. In a game where both sides viewed defence as optional for long stretches the Vikings weren’t able to hold their nerve after working their way into the lead midway through the second half. A slow start in the first 10 minutes of each half and an inconsistent set piece plagued the Vikings, but 2nd Grade were still able to show some promise, the young side steered by an ageless Michael Henry and Richard Joyes is full of potential with a full season ahead. Seamus Smith was excellent, coming out of some time in the Aus U20s camp and Travis Pula is reaping the rewards of a solid preseason. Nic ‘Clutch’ Cushan continued where he left off in 2018, providing assurance in the front row for the Club. 2nd Grade with the first loss of the day, 31-33. 1st Grade had a similar experience in their first game of the year to 2nd Grade, battling a strong Gungahlin team that took them beyond the buzzer. Just prior to halftime, Viking Park was hit with a brief but intense shower that had fans and participants of Ladies Day running for cover, but that didn’t stop the players from giving those who stayed to watch an instant John I Dent classic. The Vikings were stunned early as the Eagles crossed for two quick tries, but the Red Men were able to close the gap and head into the break trailing only by 2 points. Darcy Swain and Michael Oakman-Hunt were at their usual best, both men using their experience to guide the young forward pack. It was Jayme Field, fresh out of Colts, who was most impressive however, imposing his powerful frame on the match to give the Vikings a fighting chance. The second half saw several lead changes, as both sides continued to mount pressure on one and other in attack. The 12-13 centre combination of Brumbies Jordan Jackson-Hope and Len Ikitau combined superbly, both players now having been involved in the Brumbies set up for quite some time and their talent showing. With under 5 minutes remaining, Darcy Swain crossed for a brilliant try to put the Vikings in the lead 26-22. 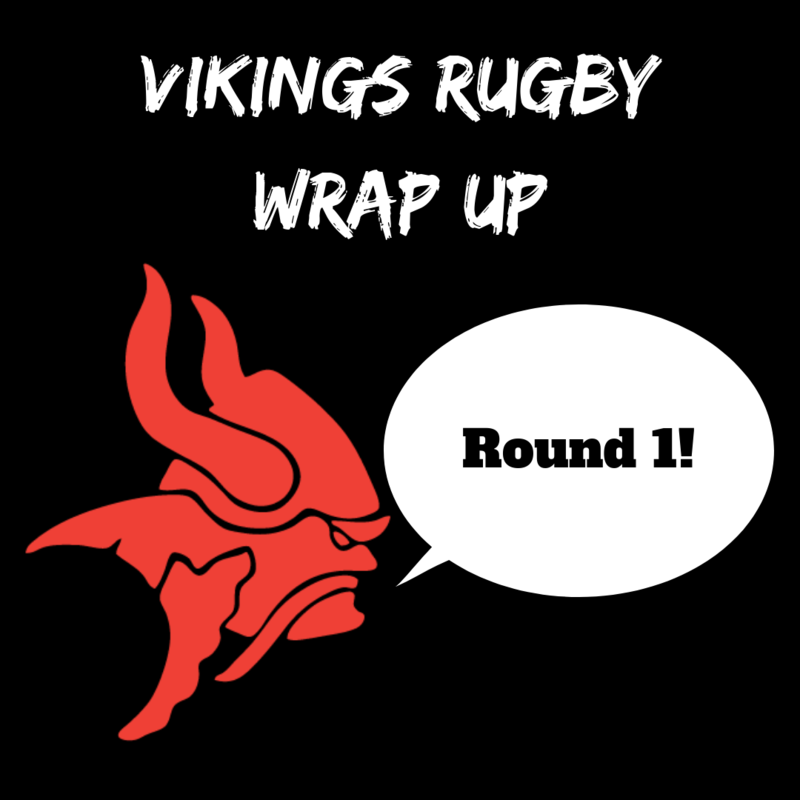 Following the kick off, the Vikings were able to regain possession but with less than 30 seconds remaining the ruck was deemed unplayable and Gungahlin were afforded one last opportunity to steal victory. 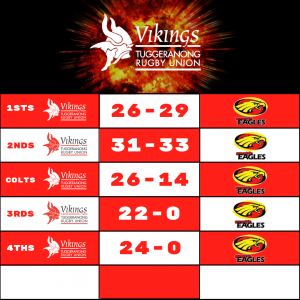 Following some probing attack and patient Rugby, the Eagles were able to set up a maul 5m from the Viking line and drive over for the winning try, well after the final siren. A disappointing result but a game the Vikings will certainly learn from, going down 26-29. That’s a wrap for Round 1 – this coming Saturday the 6th of April the Premier Division sides take on Wests at Jamison Oval, while both the 1st Division sides and the ViQueens are road tripping to Goulburn. A special thanks once more to all the ladies that attending our Ladies Day – we hope you thoroughly enjoyed your time and we hope to continue to see you throughout the year!